The DCEFRM220FXOFXSASC002 is a POTS (RJ11) port over fiber optic media converter. The PSTN two-wire POTS telephone port can be configured either as an FXO (PBX trunk) or FXS (telephone set/fax machine/dial-up modem) device just by a simple DIP switch setting. Using a pair of converters, a telephone line can be extended over a fiber optic circuit, providing full service and features like Caller ID. The converter can be used in service mode, alowing connection of 2 telephone sets in between. 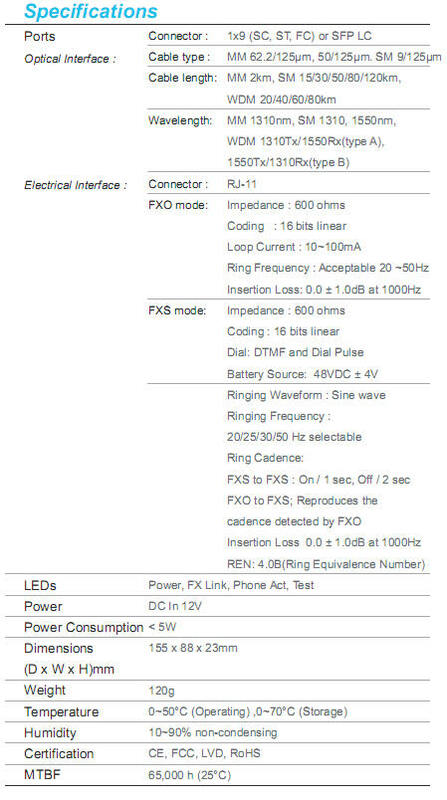 FRM220-FXO-FXS-ASC002 operates on multimode fiber up to 2Km (1.3mi) distance. The fiber media converter is equipped with dual SC type optical connector. When the DCEFRM220FXOFXSASC002 POTS over fiber converter is placed in the AFRM220 rack with in-band and SNMP management, the converters status, type, version, fiber link status, POTS RJ11 port status and alarms can all be displayed. Configuration is also available to enable or disable the port, reset the port, do far end fault setting, and initiate local or far end loop-back tests. The uniqueness of DCEFRM220FXOFXSASC002 is given by the ability to convert from standalone media converter to card for the managed AFRM220 chassis, in matter of minutes. In an always changing and growing networking environment, such a versatile feature allows network operators to switch to higher density and aggregation hubs without the need to purchase new fiber optic converters. This simple, but so reliable idea, make the DCEFRM220FXOFXSASC002 media converter the perfect choice for media converters by data carriers and service providers. The DCEFRM220FXOFXSASC030 is a POTS (RJ11) port over fiber optic media converter. The PSTN two-wire POTS telephone port can be configured either as an FXO (PBX trunk) or FXS (telephone set/fax machine/dial-up modem) device just by a simple DIP switch setting. Using a pair of converters, a telephone line can be extended over a fiber optic circuit, providing full service and features like Caller ID. The converter can be used in service mode, allowing connection of 2 telephone sets in between. FRM220-FXO-FXS-ASC030 operates on singlemode fiber up to 30Km (19mi) distance. The fiber media converter is equipped with dual SC type optical connector. When the DCEFRM220FXOFXSASC030 POTS over fiber converter is placed in the AFRM220 rack with in-band and SNMP management, the converters status, type, version, fiber link status, POTS RJ11 port status and alarms can all be displayed. Configuration is also available to enable or disable the port, reset the port, do far end fault setting, and initiate local or far end loop-back tests. The uniqueness of DCEFRM220FXOFXSASC030 is given by the ability to convert from standalone media converter to card for the managed AFRM220 chassis, in matter of minutes. In an always changing and growing networking environment, such a versatile feature allows network operators to switch to higher density and aggregation hubs without the need to purchase new fiber optic converters. This simple, but so reliable idea, make the DCEFRM220FXOFXSASC030 media converter the perfect choice for media converters by data carriers and service providers.